The bulk sector is navigating its way out of the doldrums but market correction has come at a price, delegates attending Bulk Terminals 2018 learned last week. Speaking in Hamburg at the annual conference of the Association of Bulk Terminal Operators, Frachtcontor Director Frank Grone said that while the bulk segment is slowly but steadily working its way out of the doldrums with a positive cash flow, he reminded delegates that 60mdwt was scrapped in 2015 and 2016 at “ridiculous prices”, while financing banks took serious “haircuts” leaving bulk carrier owners faced with a complete wipe out of their invested capital. The trigger for recovery, he said, has been a healthy growth in demand, which in 2017 was in order of 4% with 3% expected for this year. Fleet growth was moderate in 2017. Congestion and slow steaming have been two ingredients for recovery as it kept tonnage off the market. Slow steaming is still the flavour of the month, but a 3 to 4 knot increase in speed could kill the upturn, Grone warned. 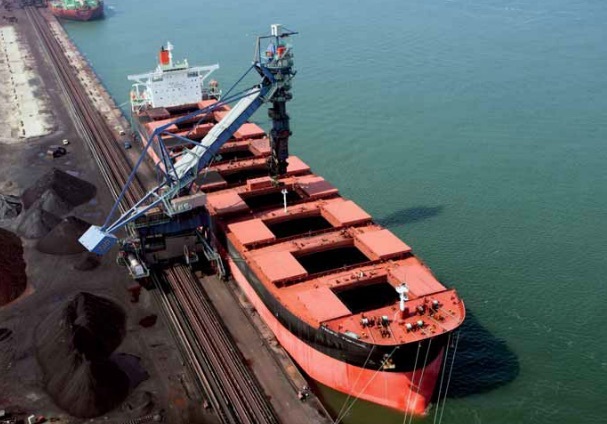 As far as bulk commodities are concerned demand for iron ore has been the major driver and the iron ore market should increase by about 2% this year and continue upwards with suppliers in Brazil and Australia ramping up production. Demand from the Chinese market is still there he said, and locally produced product is nowhere near the quality of imports. Coal is also a market driver with a 7% increase in Chinese imports and Indian imports up 6%. The overall increase in seaborne coal trade is 3-4% which is in stark contrast to Europe where imports have fallen. China, India, Japan and Korea import approximately 900mt of coal per year compared to the two biggest importers in Europe – the UK and Germany – which import approximately 110mt annually. The music, he said, is “clearly being played in the Pacific Rim”. The challenge for European terminal operators is the fact that Germany now uses 36% energy derived from renewables. The fact that Australian coal port Newcastle is now planning an ultra large container terminal to cater for a projected massive increase in movement of containerised cargo may be an indication of market attitudes going forward. In summary, Grone said growth looks positive and fleet growth manageable but there are a number of challenges. These include the trade conflict between China, the US and EU, which, he said, will affect the shipping market negatively. “The market is not only driven by hard facts, but also by sentiments”. While the immediate impact of restrictions on soya bean trades may be positive in the short term for South American suppliers, ultimately China will have to turn to the US for supplies, Grone believed. Trade barriers are generally negative in the longer term, he added. Another area of uncertainty is what will happen as a result of the global sulphur cap due to come into force in 2020. Commenting on the options available to meet the requirement, Grone estimated, on the basis of current use, that 66% of all fuel burned will have to be switched by 2020 to comply with the rules. Owners can either continue to burn high sulphur fuels and risk fines and port state control detentions and trade bans, or install scrubbing technology or switch to gasoil, he said, adding that scrubbing technology is expensive while switching to gasoil may also be expensive as the price will be substantially higher. Grone told ABTO delegates that suppliers are likely to reduce stocks of high sulphur fuel because of falling demand. Only 1200 owners have decided to retrofit scrubbers and there are 60,000 vessels that need to be dealt with. For the remainder of vessels needing to move to low sulphur products, delivery can be expected to be tight. The upside for tanker owners is that there is likely to be movement of gasoil from the Middle East, he said. The challenge for shipowners will be how to pass the costs on to charterers and to realise the competitive advantage of installing scrubbers. Another strategy may well prove to be partnerships between charterers and owners of ships with scrubbers. Grone’s market appraisal followed a key note speech from Axel Mattern, CEO of the Port of Hamburg Marketing Association, who informed attendees that Hamburg has now received the green light to dredge and rebuild the entrance channel to the port. He explained it has taken 17 years and “many battles with regulators” to get the go ahead for work on the Elbe, which up until now has meant ships with a beam of 15m or more have been unable to pass each other and have had to wait to enter the port. “Hamburg is back in the game”, he said. The Association of Bulk Terminal Operators provides a service to bulk terminal operating companies by helping to establish a favourable operating environment. As a forum for discussion on non-competitive issues, and by providing up-to-date information and market intelligence ABTO can help strengthen and support business development strategies, lobby governments and administrations to ensure operators are aware of the issues affecting the transportation of bulk cargoes and, consequently, global trade.